This morning I did my first tequio in Santa Cruz Etla. Santa Cruz gets most of its money for public works from the federal government, but indirectly. The federal government allocates to the states; the State of Oaxaca allocates to the municipalities; and the town of San Pablo Etla allocates to its agencias, of which the village of Santa Cruz is one, effectively the only one. In Santa Cruz the list of projects begging to be done is long, and the money is always short. When it comes to fixing roads, what money there is goes for things like cement, gravel, and sand, things that are not found in Santa Cruz and therefore have to be purchased. Labor, on the other hand, can be contributed. The contributions take two forms. Big jobs, the ones that involve repeated duties over a considerable portion of time, are assigned as cargos, something like “offices” or “positions.” Julio is serving his cargo as agente, or village manager; Alfonso is village treasure; Guillermo (Memo) heads public works. Lalo, the contractor who built our house, is serving his cargo in night duty on the village police force four nights a week. And so forth. When there are specific projects to be undertaken that require many hands and skills, a call goes out that on such and such a day volunteers should appear at the agencia to participate in a tequio. Tequio day is almost always Sunday, when people are presumed to be not otherwise engaged. This morning’s walk with Qalba took us by the agencia. The town loudspeaker was blaring music and a message. Santa Cruz doesn’t have a bulletin board or a local newspaper, so important announcements are communicated through a loudspeaker mounted on the roof of the agencia. It may play for a half hour or so: loud music interspersed with a spoken message. Unfortunately the system seems to be ultra low fidelity, so while the rhythm of the music comes through clearly, the words of the announcement are—to these aging ears—unintelligible. But today I was close enough to the village center that I could actually make out the message, at least on its third repetition: tequio; nine o’clock; meet at the agencia. Fair enough. I hustled Qalba home over the shortest of our looping morning routes, left my binoculars and notebook in my study, told Linda to have breakfast without me (though the aroma of frying bacon got me salivating), and panted my way back up hill to the agencia by 8:59. There were two men sitting on the steps at the far end of the covered basketball court; both had brought shovels. Soon two more, one with a battered carretilla (wheelbarrow) and one with a pick. Nobody said anything. I suspected that having an old bearded güero sitting on the steps with them was a little inhibiting. When I asked if this was the place to show up for the tequio they all seemed a little surprised I had broken the silence. Don Julio, the agente came out of the office, saw me, broke into a huge grin, and gave me warm welcoming handshake, expressed how happy he was that I had come for the tequio, and introduced me to the others. Now it was all chatter. Don Julio explained that today’s job was to finish making the culverts on the sides of the third of the Calle Cinco de Mayo that had been adoquinado a couple of months back. Cinco de Mayo is one of the cross streets that run between the ridges that come down from the mountain, the lomas. The cross streets all plunge from the loma down to a gulley and then rise steeply to the loma on the other side. For the most part the streets are dirt, terracería, and in the rains the steep bits get rutted and the flat bits at the bottom get muddy. To date only one of the cross streets in Santa Cruz has been completely surfaced with adoquines, interlocking cement blocks over a thin base of gravel. Cinco de Mayo was been partially surfaced about the time we finished building and Lalo had to lay off much of the workforce. Lalo’s brother Gabriel headed that adoquinado crew. They only did one third of the street because that is all the resource allotment permitted. Now the village had received a little more money for cement and gravel, so they could put in the rest of the culverts on both borders of the adoquines. Before long, we were twelve. All men and all seemingly in their forties or fifties except me and one other, a boy of about ten or twelve who had showed up with his father. 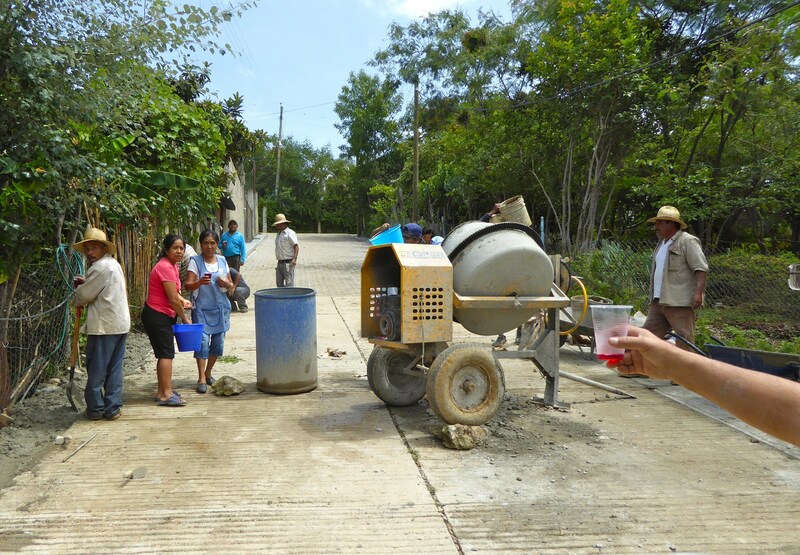 We walked down to the work site at the bottom of the gully where half of us began pulling rocks out of a dirt-covered mound between Julio’s house and an alfalfa field, and half walked up the hill to the culvert site to get the revolvera (small gas-powered cement mixer) fired up. I stuck with the rock men. The alfalfa field was about two meters lower than the road, and the rock/dirt pile about three meters distant from the road. Two men dug out the rocks with picks and pry bars, tossing their finds to another two who had braced themselves against some bushes on the side of the embankment. The two catchers then swiveled and tossed the rocks up onto the street, where I and another man loaded them into wheelbarrows. I can push a loaded carretilla on the level; downhill, it gets away from me; uphill I didn’t think I could do it. But everyone else was busy, so I gripped the wheelbarrow’s handles, leaned forward and put all my weight into it, and slowly rolled it up to the culvert site. When I finally got there—we’re talking thirty or forty steps worth of climb—I was panting as if I’d just finished a triathlon. Still, I managed wheel up three more loads of stone before I succeeded in handing off the carretilla to one of the younger guys. Good aerobic exercise, this tequio. 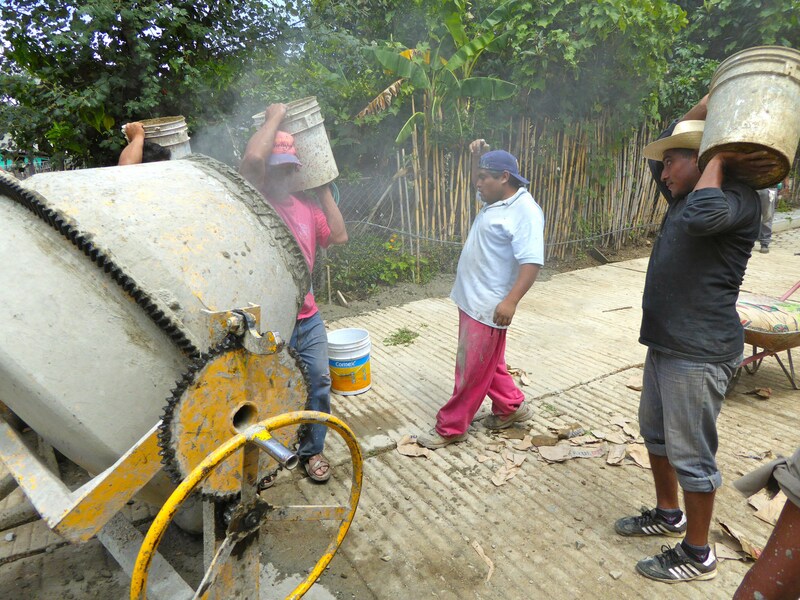 Meanwhile, everything was set to begin mixing cement except getting the revolvera’s motor to fire up. The man who’d taken on that task wound the pull cord and yanked it with all his might at least a dozen times until the sweat had soaked through his shirt and was pouring down his face. Nothing. Then a young couple on their way to church came down the street, their two-year-old holding tight to their hands and swinging between them. As they drew near, Memo called out to them. By now we were fifteen. No one seemed to be in charge, but everybody (except me) seemed to know exactly what to do. People took up the required tasks with a minimum of fuss and an extraordinary economy of movement. Feeding the revolvera with buckets with sand, gravel, and water. Dumping two 50-kilo bags of cement into each batch. Clearing weeds from the edges of the culverts (me). Cutting wooden forms and form braces for the culverts and hammering them into place (the man who’d brought a saw). Repositioning the water pipes that fed into the two compounds that bordered the culvert. 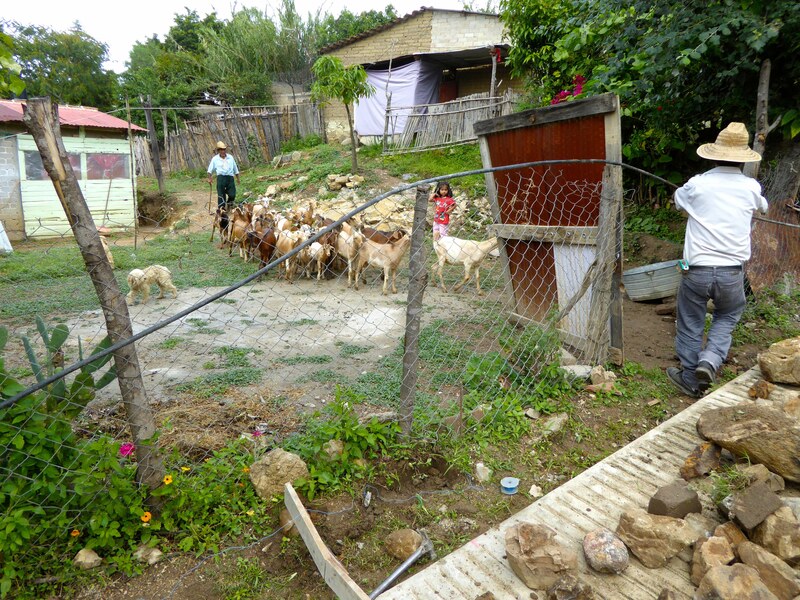 I moved some detritus out of an old man’s gateway so that he could get his thirty goats out of his yard and onto the road to go up to pasture, while his dogs barked and his granddaughter watched with wide open eyes the scrambling goats and the bearded güero. Mostly I picked up this and cleaned that and brought people tools and carted off waste as needed, just like one of the young apprentice chalanes on our Casa project. Mostly I moved rocks, the ones that we had dug out and hauled up the hill in carretillas earlier that day. In several places the terrain over which the culvert had to run had large dips in it. The rocks were to fill in the dips before the concrete was poured over them. The spaces could have been filled with concrete, of course, but cement and sand and gravel cost money, and the rocks were there for the finding, with the labor to move them, as always, donated. I moved the rocks that I could lift and fitted them as tightly as I could into the bottom of the culvert ditch. The ones I couldn’t lift — well, everybody else at the tequio could handle them with apparent ease, and I was pleased to let them take up the task. After an hour and a half of uninterrupted work, three women came out of Julio´s compound, bringing through his bright green gate a garrafón, a 20-liter water bottle, on a stand and a sack of plastic cups. In tequios, I’d heard, the men do the heavy work and the women support, mainly by providing food and drink. Sure enough, 45 minutes later a woman appeared with a bucket of individually wrapped tortas, sandwiches with a slice of ham, a slice of cheese, several slices of green chiles, all in a long soft roll, each torta wrapped in paper. Another dispensed agua de jamaica, hibiscus drink, from a blue bucket. It was almuerzo time, mid-morning break, an absolutely sacred moment of calm in every construction job. For twenty minutes we all sat on the road’s edge, munching our tortas, drinking glasses of water or Coke, and quietly exchanging gossip. Then, as if someone had rung a bell, we were all back at it. culpted smooth with hand trowels and scraps of board, were curing in the sun. Four men rolled the revolvera down to a side road until Lalo —yes, our construction boss, that Lalo, who had loaned his revolvera for the tequio— could come with his truck and pick it up. No one else looked as wiped out as I felt, but we were all equally dirty, covered with mud, flakes of stone, and blobs of cement. Four women were sweeping the road free of leftover sand and gravel. The job was done, but I couldn’t figure out why no one was leaving. A chorus of jeers and sarcastic comments. Well, that explained why no one was leaving. No one but me, that is. I’d long since passed my sunshine limit, my legs were trembling, and I ached from my shoulders to my ankles. Explaining that I didn’t drink mescal (protests), or any alcohol, really (disbelief), because of my transplant (astonishment, that doubled when I pulled up my shirt to display my scar), I bid my adioses and staggered up the hill toward home. But not before I’d extracted separate promises from Julio, Memo, and Alfonso that, since I couldn’t hear the loudspeaker announcements down at the Casa Davilinda, they would make certain I was notified the next time they were calling a tequio. I figured if I asked all three, maybe one of them would remember.